Flipping through the Detroit MLS these days produces some sad-trombone listings, but we keep coming back to a 10,395-square-foot baronial Tudor listed for $759,000. Since not even the Motor City can stay woeful forever (that’s our inner Pollyanna speaking), we decided to feature what appears to be a steal. Yes, it is in Detroit proper. Properties in the suburbs, while down in value, still carry heftier price tags than those in the city — where officials were literally giving homes away to first responders who would take them and just agree to please live there. But this one? It looks like a gem that needs some polishing to us. Your thoughts, readers? What you need to know: It’s the brick-and-limestone mansion built in 1922 for Charles Van Duesen, then the president of S.S. Kresge, one of the 20th century’s largest and best-known retailers. The Kresge chain was renamed the Kmart Corporation in 1977 and today is the parent company of Kmart and Sears. Let’s just say that Mr. Kresge had a good eye for the fine finishes and the wallet to back his tastes. 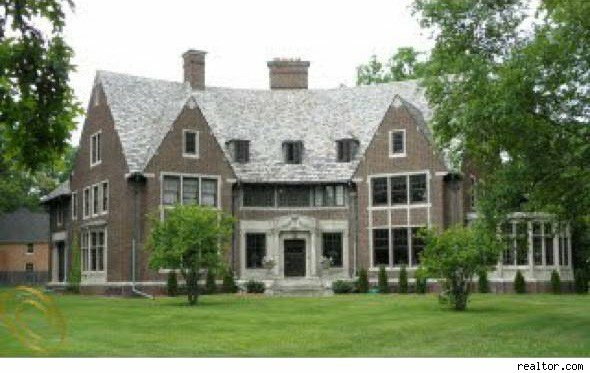 Located in Palmer Woods (for non-Detroiters: This is a good thing), the seven-bedroom mansion has gigantic rooms and has been completely restored. There is a large walnut-paneled central great hall with a fireplace and art-tiled flooring, another huge living room with a carved marble fireplace, and a dining room with a stenciled beamed ceiling. The library is built with quartersawn oak and there is lots of art-tiling in the bedrooms. The home has a billiards room and a two-bedroom apartment over the garage. Kenan Bakirci, a Realtor with Max Broock Realtors in Birmingham, is both the owner and listing agent. See more Houses of the Day and other homes for sale in Detroit, Mich. on AOL Real Estate.